During our Exploring Artism program on Saturday, participants were invited to take a look at the temporary exhibition of work by Nicola Hicks. 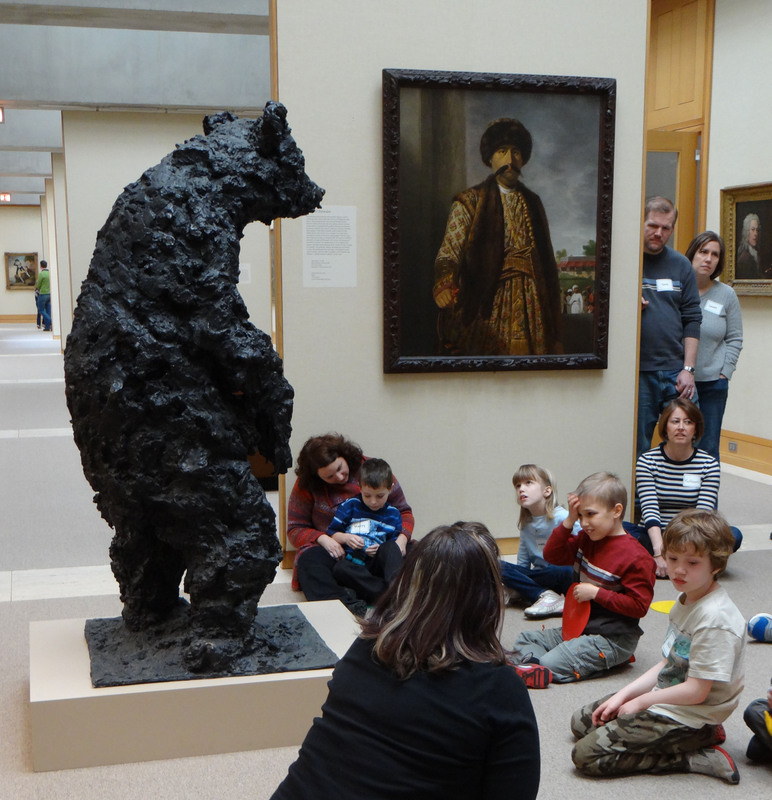 We focused on a sculpture of a black bear called Black. Her large scale sculptures incorporate straw and plaster, making for a great tactile experience for our Artism participants. We began our program with a bear icebreaker quiz and an opportunity to do some painting. The painting was part of our post-gallery project (which we will address later). Here is the popular bear icebreaker, and here is the accompanying PowerPoint with the quiz answers. 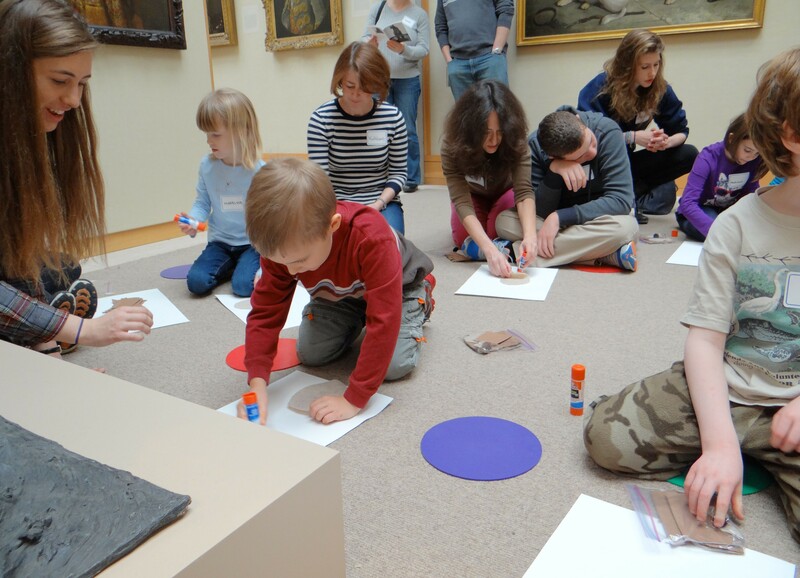 We also went over our Social Story, covering museum rules and directions for the program. Next, everyone was invited to let out a large bear growl or roar before we headed up into the gallery to view Nicola Hicks’s Black. Sitting in front of the sculpture, participants were asked to look at and describe the artwork. How is the bear standing? Can you stand up like the bear? (Everyone attempted to imitate the bear’s stance). How do you think the bear is feeling? Have you ever seen a real bear? Where? Next, we sang a song about meeting a bear. You can see the full song here. We sang just a few stanzas to remain on time. After our song was finished, participants were asked how they thought the artist, Nicola Hicks, created this bear. What materials did the artist use? Why? How did she make it? Nicola Hicks actually used straw and plaster to create her sculptures. 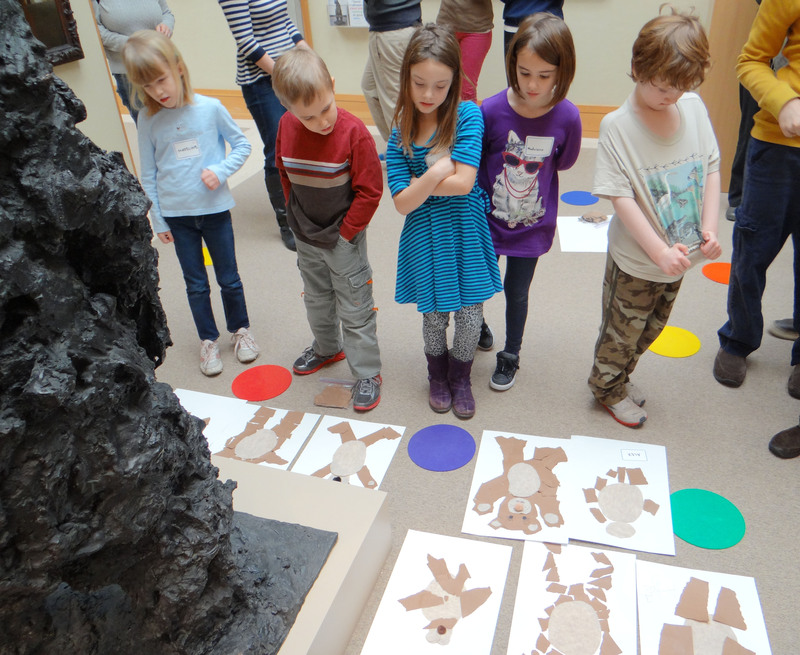 Since we cannot bring straw or clay into the galleries, participants were invited to create their own “Tear Bear” using brown construction paper and felt.Tearing the brown construction paper created an almost fur-like appearance to the bears while also providing a multi-sensory experience through the sounds and movements of tearing the paper. When everyone was finished with their tear bears,they placed their creations in front of Black and admired the uniqueness of each bear. 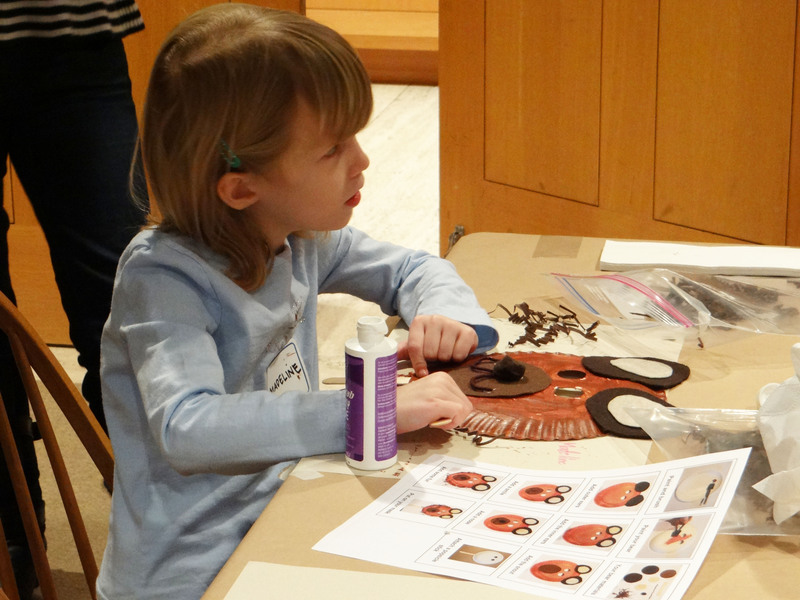 Having finished in the galleries, participants headed back to our Docent Room to work on creating bear masks out of the paper plates that we were painting during the warm-up time. 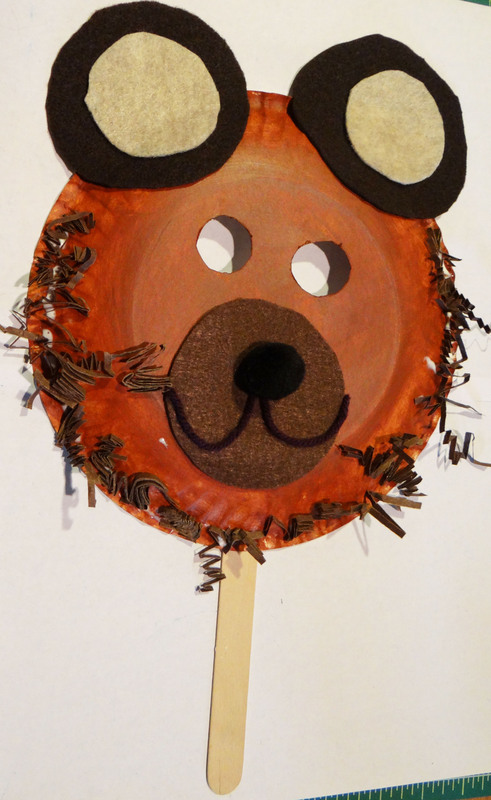 Using the paper plates with holes cut out for eyes, brown paint, pieces of dark brown and light brown felt, yarn, puff balls, and Popsicle sticks, and brown shredded paper we were able to create our own bear masks to wear. 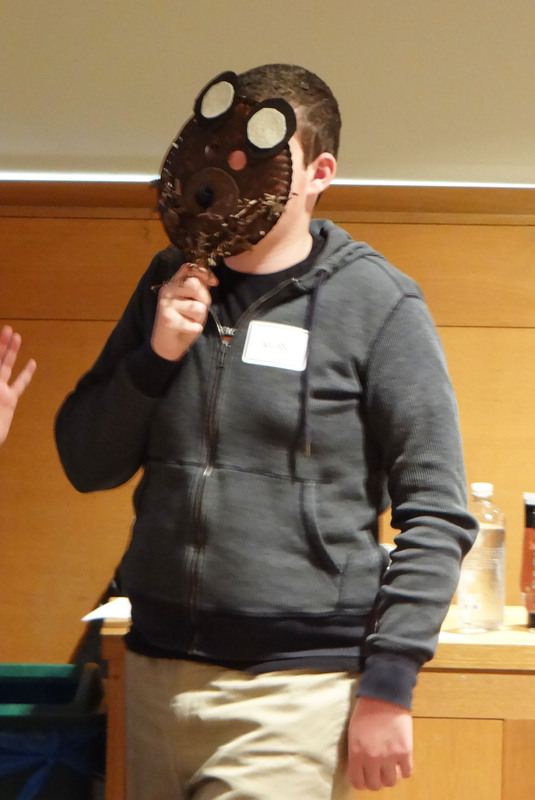 Here is the step by step explanation on how to make the bear mask. All participants had the opportunity to share their finished creation at the end of the session. High Seas and High Teas TOMORROW! 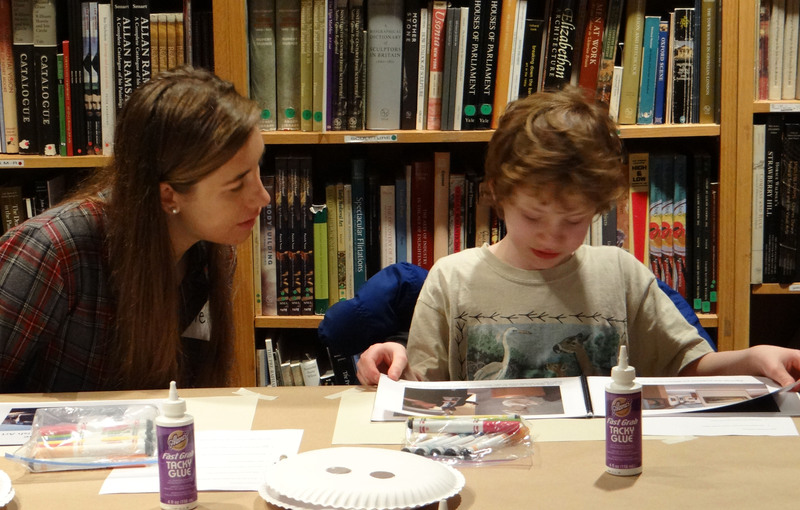 Amy Larkin on If you’re visiting the YCBA, please review our social story. Anna on If you’re visiting the YCBA, please review our social story.